What will make you feel and look great again? In my previous post “Superfoods, What Are They?” I introduced the idea that microgreens should be on your superfoods list, so now I am going to look into the question; Are microgreens a superfood? To answer this question I will look at what microgreens are, the difference between microgreens and sprouts, what are the healthy benefits of microgreens and which microgreens have the highest nutritional value and what is the best way to get your microgreens. Microgreens are edible vegetable and herb seeds that germinated and grew until they produced their first set of “true leaves”. It takes anywhere from 7 to 14 days to reach the harvest able size, three to five days in complete darkness right after the seeds are planted and then they are placed on a counter top in a room with plenty of windows to allow enough sunlight in or a growing rack with grow lights for 4 to 7 days, until time to harvest. The seedlings, usually only reach a size of 4 to 6 inches in height, depending on the seed variety planted. No Microgreens and sprouts are not the same thing. The main difference between sprouts and microgreens is, sprouts are usually germinated in a jar with water for a few days, until they taste good and some like alfalfa sprouts are moved to a tray to straighten up and grow taller. Microgreens are grown in a growing media/soil or on a grow fiber mat, sometimes with some organic or inorganic fertilizer and minerals added to speed up the germination or improve the microgreens nutritional value and other times, microgreens have nothing added to speed up germination or improve the microgreens nutritional value. Since microgreens are germinated seedlings of edible vegetables and herbs, the microgreens have all the same vitamins and minerals and nutrients that the mature vegetable or herb plants have and even more, particularly vitamin K, vitamin C, vitamin E, beta-carotene and lutein. As it turns out a study in 2012 on the nutritional value of microgreens concluded that, microgreens actually have 4 to 40 time the nutritional value of the mature plant, with the same or more intense flavor and good texture. The researchers were so surprised by their results that they had to quickly double and even triple check the results. So far only 25 different varieties of commercially grown microgreens have been tested by this group of researchers, so more research is still needed to determine nutritional value of the different types of microgreens available. There were four microgreens that were tested and were found to be extremely high in vitamins and nutrients, they are Green Daikon Radish, Red Cabbage, Garnet Amaranth and Cilantro. Red Cabbage was found to have extremely high amounts of Vitamin K, Vitamin E, and vitamin C which are extremely important in fighting cancer and for the eyes and skin. Cilantro was found to have the highest concentration of beta-carotene and lutein which can help slow cognitive decline, retain lung strength and is good for the eyes. Garnet Amaranth was also extremely high in vitamin C, Vitamin K and vitamin E. Good for the eyes, skin and can help fight cancer. Green Daikon Radish was extremely high also in vitamin K, vitamin C and vitamin E. Again known to help fight cancer and is good for the eyes and skin. There are two main ways to get microgreens, The first and easiest way is to buy the microgreens at your local farmers market or local organic foods store and you can sometimes find some microgreens in a regular grocery stores produce department. The main thing to remember when purchasing microgreens is to find the darkest colored microgreens because they are typically the richest in vitamins and nutrients. For those people with a green thumb, the second easiest way to get microgreens is to grow some microgreens for yourself. Take a shallow bowl or planter, using enough potting soil to cover the bottom of the container with about half an inch of soil, sprinkle the seeds on top of the soil with one layer of seeds covering the soil but do not put in too much seed ( only one layer of seed is needed), cover the seed with a very thin layer of potting soil. Sprinkle the seed with water, just until the soil is moist and cover with a dark lid or place in a black trash bag or place in a closet or other dark spot in the house, as long as it stays room temperature you should be OK. Sprinkle the seeds with water daily, after the third day ( if the seeds germinated they will look very pale ) take the planter out of its dark growing environment and put the container in a place that gets plenty of natural light or under a grow light. Sprinkle water daily for about 10 days or until the microgreens are tall enough to cut or when they taste the best. I really believe microgreens should be on your list of superfoods to start adding to your diet. Based on the new research proving that the microgreens are typically richer in vitamins and nutrients than the mature plant of the same type, it certainly can not hurt to start adding them to salads and soups but you may want to add some microgreens to your smoothies, just remember the flavor is pretty strong. Just do not cook the microgreens since microgreens are mainly water. “Superfoods are described by some as a marketing term for foods that have health benefits”, others would say “Superfoods have extra large doses of vitamins and minerals that can help us fight diseases and live a longer, healthier life”. The Merriam-Webster Dictionary defines a superfood as ” a food ( such as salmon, broccoli, or blueberries) that is rich in compounds ( such as antioxidants, fiber, or fatty acids ) considered beneficial to a person’s health.” Since there is no regulated definition of superfood and there are no scientific requirements to be classified a “superfood”, I have decided to look at the foods that tend to appear on all the superfood lists you will see on line and look into why they are a consensus pick for being called a superfood and why they should be on your superfoods list as well. 1. 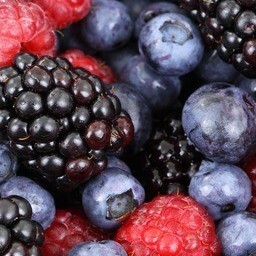 Berries (Dark Berries): Blueberries, Blackberries, Raspberries, Strawberries and Cranberries. “Dark Berries” are packed with flavenoids… A study was conducted on the ” Dietary intake of berries and flavenoids in relation to cognitive decline” by Elizabeth E. Devore, ScD, Jae Hee Kang, ScD, and Francine Grodstein ScD and their final conclusion summery stated “Higher intake of flavenoids, particularly from berries, appears to reduce rates of cognitive decline in older adults”. Flavenoids are one group of polyphenols that have been associated with many health benefits such as: blood sugar control, reduced blood clot formation. Plant polyphenols are also rich in antioxidants that can help fight off harmful free radicals and prevent damage to cells and lower the risk of chronic disease. “Dark Green Leafy Vegetables” are packed with nutrients like calcium, folate, iron, magnesium, zinc, vitamin C and fiber. They are also packed with cartenoids ( an anti-inflammatory compound ) which is thought to protect against certain types of cancer. It is also thought that because the “Dark Green Leafy Vegetables” are packed with nutrients and fiber, they may reduce the risk of type 2 diabetes and heart disease. Brussels sprouts, cabbage, kale and bok choy are also packed with glucosinolates ( sulfur containing compounds ) that are good for detoxifying your body too. Nuts and seeds are rich in proteins, fiber and the fats that are considered “Heart-healthy”, they are also high in the plant compounds that have antioxidant properties and are anti inflammatory. Some studies on nuts and seeds have been shown to help fight heart disease. Macadamia nuts in particular, have the most fat and least carbohydrates and proteins of the nuts, and Macadamia nuts are high in magnesium, manganese and vitamin B1. Dr. Mercola in the article “What Are the Best Nuts and Seeds?” also stated ” about 60 percent of the fatty acid in macadamia is the monounsaturated fat oleic acid. This is about the level found in olives, which are well-known for their health benefits”. Almonds and Cashews are also a great source of monounsaturated fats and protein, vitamins and lots of minerals. Pumpkin seeds are a great source of Magnesium and zinc, a handful of pumpkin seeds is 130 calories though so eat sparingly. Hemp seeds however I almost put into a category of their own not because of the discussion of weather hemp seeds are seeds or nuts but because hemp seeds are one of the superfoods that I think is exceptional because they not only are a great source of protein but they also contain all the essential amino acids for growth and repair but hey also have a great ratio of omega 6 and omega 3 fatty acids as well as being a good source of amino acids. Hemp seeds are also a great source of magnesium and potassium and vitamins B, D and E. Unlike other nuts and seeds, hemp seeds do not contain phytic acid. Phytic acid can block absorption of minerals like iron and calcium. Hemp seeds are also a great source of soluble and insoluble fiber. Insoluble fiber helps the digestive tract work well and helps control the pH in the intestines, which can help prevent colon cancer. Soluble fiber helps to regulate blood sugar levels and can control bad cholesterol too. Olive oil and olives are a great source of monounsaturated fat and olives only have 7 calories per jumbo olive. Oleic acid makes up the greatest percentage of the monounsaturated fats which has been connected with decreased inflammation and a reduced risk of heart disease and may help fight some cancer. Olives and olive oil are a great source of vitamin E and other antioxidants, which are good for the heart too and may also help prevent osteoporosis and help prevent cancer. Avocados are a great source of monounsaturated fat, vitamins C, E and B, potassium, magnesium and antioxidants but avocados contain carotenoids that are found in the dark green part of the avocado by the skin. Carotenoids have been studied and found to possibly fight against certain cancer, heart disease and age related macular degeneration. One study found that if you ate a moderate fat diet and one avocado per day that it could lower your LDL more (by a significant amount), compared to a normal American diet. Another study found that avocados may also improve good cholesterol by adding an avocado a day to your diet. Avocados have even proven to help lose weight if you eat a half of an avocado with lunch, you feel fuller longer. The same study found that eating the half avocado also helped regulate the blood sugar and they help your body absorb fat soluble nutrients from other foods. Spirulina is a blue-green algae that is grown all over the world and is one of the worlds oldest food sources, the Aztecs consumed this super food in Mexico in the 16th century and people in Chad ate this same algae 1000 years ago. Spirulina has a very high amount of digestible protein so it provides a big energy boost and provides immune system support because of high concentrations of vitamins and minerals. Spirulina is also considered a natural detoxifier because it oxiginates the blood and purifies it of toxins (this is one of the possible problems as well). Spirulina is also high in antioxidants, which can help balance the body pH and it is considered a great natural weight loss supplement because taking spirulina over time can reduce cravings to eat, so over time you may eat less. The main reason this is on my list is because spirulina is a complete protein, so it contains all 9 essential amino acids and 10 times the amount of beta carotin found in carrots. I put an asterisk by this one because even though some people swear by it, I think more studies to determine best growing practices for consumption by people need to be done but I like its possibility of being a true “super food”. What is special about these “Superfoods”? The reason I had chosen these foods as “superfoods” out of the many other foods people consider “Superfoods”, is because they are not only easy to come by at your local farmers market or Whole foods or something similar and they have the most health benefits, but some other “superfoods” are more difficult to find or as in the case of salmon, you want to find “wild” salmon and not farm raised. In the case of eggs, they need to be from free-range chickens. Foods like kefir, acai, goji berries, chia seeds, these are not as easy to find and how do you know if you are getting the best quality. Some other foods on some “superfoods” lists like bananas, apples, kiwi, pumpkin seeds and black beans are all good foods but not every good food is a “super food”, or they did not show up on enough super food lists. The exception was one list that had wheat grass and it was being promoted because of the chlorophyll content, however Dr. Steven Gundy says ” humans can’t digest grass” “our bodies weren’t built to process wheat grass or any other kind of grass…if we were, we’d have 4 stomachs like a cow”. Too, the superfoods I listed can (for the most part) be grown fairly easily, depending on where you live, except for the hemp seed and spirulina. What other foods should be superfoods? The only food I would want to add to the list would be microgreens. When you look at the list at the top, all the green leafy vegetables and some seeds can be grown as microgreens and some superfoods lists had different sprouts listed, since microgreen are similar and or more nutrient rich than sprouts, microgreens should be on your superfoods list too. There are many foods that could qualify as a super food but until additional studies are completed, we have not identified that 1 perfect super food like “mana from heaven”. So until then, including the above superfoods into your normal daily diet will provide the best benefits you can get by just adding some great foods to your existing diet. Many people are talking about CBD oils for many ailments but you may have not heard that CBD for ED is a very real option. As I have gotten a little older I have had reasons to look into different methods of making sure I can perform when needed not when I was good and ready, Like most men I thought about taking a pharmaceutical product, but which “blue pill” or other choice is best and safest, or would a herbal supplement be better, or is there a possibility that the new wonder supplement (CBD) could be an option. Having a desire to find a product that would have the desired effect without any strange or (worse) detrimental side effects, I began to look for the best option. After a great deal of research and a desire to see results quickly and also hoping to see extra benefits like eliminating back pain caused by a broken disk and a pinched nerve at the base of my neck that shot pain into my arms and hands, I decided to try CBD oil, 750mg from CTFO ( Chew the Fat Off ). I ran across CTFO looking primarily for an easy weight loss product but CTFO recently released CBD products and I knew that CBD was known to help reduce pain, and possibly help with ED so I felt like this was a logical product to try. As an added benefit CTFO has a program where you can have a website for free that you can sell and purchase the products and purchase the products for yourself at a discounted rate so I decided to give it a try. Upon receiving my CBD oil I started taking the 20 drops under my tongue as directed and quickly found out that was not going to work well for me because I could not tell if I had put 20 drops or not. So first I started adding it to a little water which worked fairly well but some CBD oil would stay at the bottom of the glass and again I was not sure if I was getting the best results because I was not getting the full dose. After some additional attempts at mixing with food I realized I could put 10 drops on a corner of my piece of toast and put the bread under my tong without losing the CBD oil and then I placed 10 more drops on another section of my toast and placed it under my tong as well. So now after taking the CBD oil successfully taking the recommended dosage and only 1 time per day, I have been able to control my back pain and eliminate my other pain killer that I had used for several months and another benefit was that my anxiety attacks were happening less often which was a big plus. I have to admit I was thinking that the 750 mg CBD oil may not be strong enough to help with the ED but now after a month I am noticing a significant improvement in that area as well. Of course, I never went to a doctor to find out why I was having the ED, whether it was stress related, psychological or because of other medical issues or maybe even the medications I had been taking to help relax my muscles, I really do not know why but now I am getting back to normal and I feel quite confident that it is because of the CBD oil. The last benefit still remains to be seen if the multilevel marketing aspect of getting my CBD oils from CTFO works but I do have 2 free web sites, the one I think might actually do something. Now, http://fzhabon.MyCTFOCBD.com is my site for the CBD oil, since I am an affiliate I set up a monthly order at a significant discount off of the retail price and after looking at several manufactures I realized CTFO had very competitive prices for the 750 mg CBD oil. You could find cheaper prices on CBD oil but it was not as strong so when comparing apples to apples, CTFO was a good product to try. I was definitely ready to try a different CBD product if I did not see results but at this point I do not see a reason to change. After hearing about the: Endo Cannibinoid System that helps our bodies reach homeostasis. That told me that our bodies are able to use the cannibinoides to make our bodies “balanced” and so diabetes, cancer and some other major medical problems could all be controlled by taking CBD oil. I really like the idea that taking the CBD oil may be doing more to help my body than I realize right now. I may decide to start taking the 1500 mg CBD oil but only if I start making money from the multi level marketing aspect of CTFO. As of right now I am very satisfied with the 750 mg CBD oil that I am currently taking. If I had to I could start taking the 20 drops twice a day or even more if needed without worrying about over medicating or worse becoming addicted. Too, I decided a long time ago, if I ever was diagnosed with cancer or any other deadly disease I would start taking Medical Marijuana before any other medications or worse radiation therapy because I believe in the healing power of Hemp. I will continue to report on any change in results good or bad so stay tuned. If you have any questions or comments please feel free to leave them.